Mini banners, also known as Garden Flags are approximately 12x17 inches. These great little flags are smaller versions of their cousins, the "Breeze-Thru" Decorative Flags. Will of the Wind's Mini-Banners provide a splash of color and charm to porch, garden, patio or as room decor. Mini Banners may be displayed with the mini garden stand, the wall hangar or the mounting bracket. 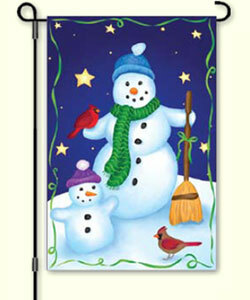 Collection includes Christmas flags, Butterfly Flags, Breeze thru Flags, Blue Bird Flags and more... Enjoy your Garden Flag for years to come.